Like many people in the Kansas City area, I was snowed in on Tuesday due to the blizzard (AKA Snowmageddon; Snowpocalypse, SnowMG; etc.). I have a hard time sitting still for long periods of time so after only a little while I was going stir crazy! It was a cold, blizzardy (is that a word?) day and I was craving some comfort food. So, out came my stand mixer for a little fun. 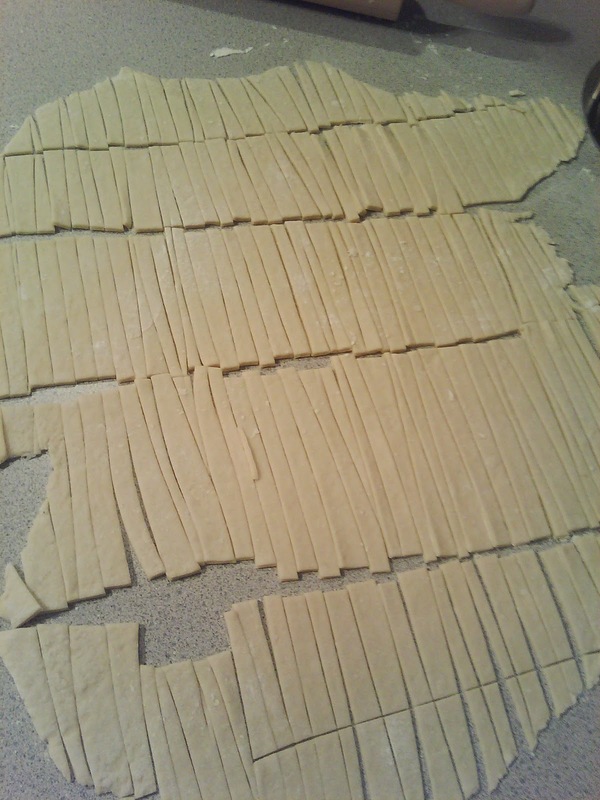 I remember making homemade noodles with my grandma, great-grandma and my mom but I don’t remember them ever being this easy! And not to mention, I had all five ingredients on hand! They were so delicious and even better for lunch the second day! 1. Chill the bowl of your mixer for 5-10 minutes. 3. Slowly add salt and flour just until incorporated. 4. Flour a large surface and turn the dough out. 5. Knead thoroughly until a smooth ball forms. 7. 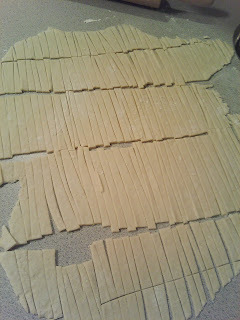 Cut with a knife or pizza cutter, toss in extra flour and let air-dry for at least an hour. 8. Cook noodles in salted, boiling water for 7-8 minutes or until they reached the desired consistency. Why is there no way to save this to the Recipe box or to print this recipe. I had never added the recipe format to this post. It’s there now. How long does these keep before you have to cook them? I have never tried to freeze them, I ususally make them when I’m ready to drop them into soup. 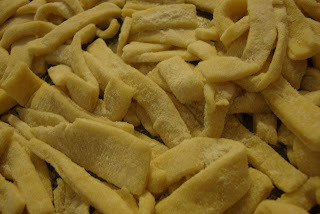 If you would like to try freezing them, I would do so after they are cut into strips. Lay them in one layer on a large cookie sheet and then freeze until frozen. Then store in an freezer-friendly airtight container, or freezer bag. Enjoy!